Mind-your-own-business or baby’s tears, Soleirolia soleirolii (syn. Helxine soleirolii) is a creeping perennial with tiny rounded leaves. Despite looking pretty in cracks in paving, it re-grows from the smallest stem sections and can soon get out of control. It is especially difficult to control in the lawn. Mind-your-own-business is often a weed. Credit: RHS Herbarium. Why is mind-your-own-business a problem? This plant is a native of Corsica and Sardinia and is occasionally grown in rock gardens and in greenhouses. It readily colonises crevices in dry stonewalls but can be a nuisance in borders and lawns, where it is regarded as a weed. Mind-your-own-business forms dense, slowly spreading mats of bright green foliage. The golden-leaved form, ‘Aurea’, is the most commonly sold. It bears minute white flowers in summer. The overall height is a mere 5cm (2in) but spread is indefinite. 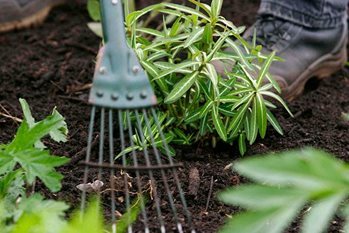 Although many gardeners like to encourage mind-your-own-business between cracks in patios, it can get out of hand and spread to borders and lawns. The thin, fleshy, much-branched stems root as they slowly spread. This is a difficult plant to control, as it regenerates easily from any small sections of stem over-looked when weeding or hoeing. Grass clippings that contain stem sections may survive the composting process, causing the weed to be further spread around the garden. Mind-your-own-business is resistant to all lawn weedkillers approved for garden use.